I wasn’t keen to upload the screenshots of my profits on the 2nd day of trading at Betfair. On the request of my loyal followers on betting adda I decided to upload the screenshot and give some insights on how I manage to make £1,384 in profit on the 2nd day of this Test match using a combination of Tarazu and back/lay strategy. As you can see in the snapshot above I’ve £0.00 liability which means I’m not losing any money at all no matter who wins the match or it’s a draw. Now look at the cashout box. I’ve option of cashing out £243 with £1,348 of profit irrespective of the outcome of the match. So as it turns out I’m in £1348 profit at the end of 2nd day of trading at Betfair. I only started trading after the end of day 2 and managed to green up just before NZ collapse. I would leave this trading as such and observe Pak’s batting. I expect them to fight back and score around 400 which they have been doing so easily in desert. I’ll hit another jackpot if Pakistan manages to score over 600 at the end of 4th day giving NZ 90 overs to draw the match. 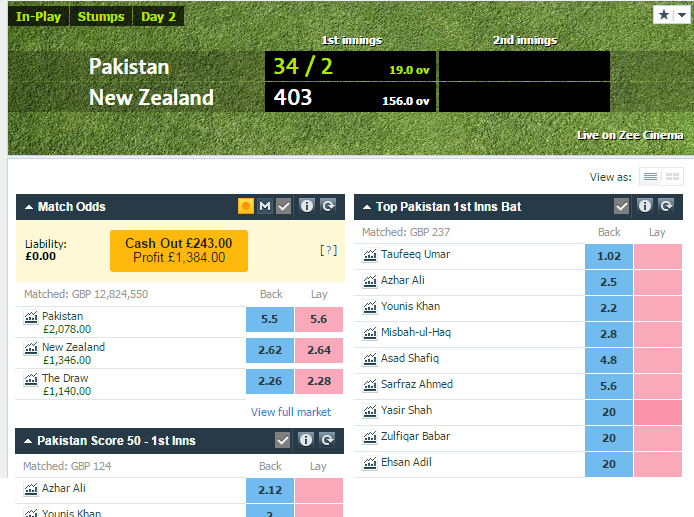 Pakistan’s bowlers might pull this off on the last day which will give me maximum profit. I leave you guys to figure out how I did it. I’ve given you enough free tips on all of these strategies which I’ve been using by myself. This match is turning out to be hooot. Munna bhai ur prediction can help. I sitting with bet on draw. What I should I do. I did a mistake. Betted on draw at very low price i.e is 0.35. If you have backed draw with .35 then wait. You can do nothing. Just pray that match ends up in a draw. Who said to you to back draw at such low price? You were high on ganja or what? If you are lucky price can come down below .35 which is very unlikely. Never back draw at such low price. If you want to back draw then always back with odds above 3.0 never below that. the reason for backing odds higher than 3.0 is to apply Tarazu. You back draw when you are absolutely certain that it’s going to be a draw which you can predict only after 3 days. I back draw at higher odds at the start of match when I’m going to use Tarazu. Sorry Munna bhai. Won’t ever commit such again. bhai pls help me how to deposit using nettler to betfair….any other method!!! skrill not able to click gambling button maybe my country law pls help me ! !